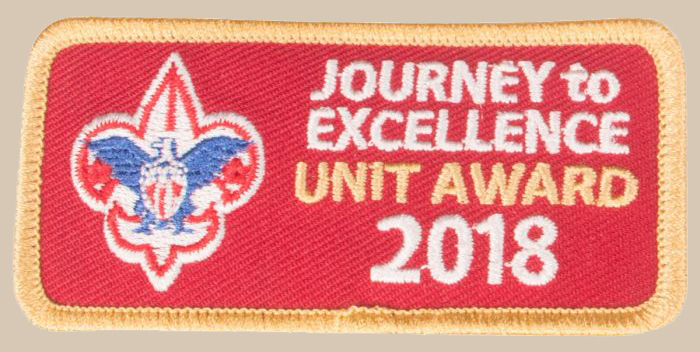 For the sixth straight year (which is every full year of the troop's existence) Troop 50 has achieved gold status in the BSA assessment process known as Journey to Excellence. The program is a self-evaluation which allows units, districts, and councils to measure their strengths with a goal of continual improvement. The unit scorecard contains eleven objectives in the fields of Planning and Budget, Membership, Program, and Volunteer Leadership; and rates various metrics at bronze, silver, and gold levels. 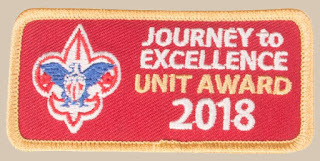 year's end), advancement (71 percent of our scouts advanced by at least one rank), and leadership & family engagement (due to our large number of registered leaders and parental involvement). We also scored in the silver range for our camping program, consistent use of the patrol method, and our Webelos to Scout transition plans. We received a total score of 1250 points to achieve gold status, which required us to meet at least eight objectives with a collective total of 1000 points. The troop has much to be proud of in 2018. Our scouts collectively earned ninety-nine merit badges and had thirty-five rank advancements. This included three new Eagle Scouts and six Eagle Palms. In fact, we now have four Eagle Scouts who have each earned Bronze, Gold, and Silver Palms. Scouts and adult leaders together spent 408 nights of camping, hiked 154 miles, and gave 971 hours of service to the community. These numbers not only reflect on the commitment by the scouts to the program but also the high level of support that we receive from adult volunteers, parents, our charter partners at the Auburn Rotary Club, and the members of the First Presbyterian Church and Auburn United Methodist Church. This meaningful support gives us what we need to meet the troop's mission to GATHER young men into a quality scouting program, GROW them into servant leaders, and GO into the community in service and fellowship.